According to a study reported Tuesday, nearly half the members of the United States Congress are millionaires. Of the 535 legislators (100 members of the Senate and 435 members of the House of Representatives), at least 250 are millionaires and the median net worth is $913,000. 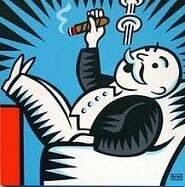 Sixty-seven senators are millionaires and the median wealth of the body’s 100 members is $2.63 million. While the Senate has long been known as a millionaires’ club, the transformation of the House is a relatively recent phenomenon. The median net worth of members of the House of Representatives, excluding home equity, has more than doubled over the last 25 years, from $280,000 in 1984 to $725,000 in 2009 in inflation-adjusted dollars. During that same period, the median net worth of an American family fell from $20,600 to $20,500. Both the Washington Post and the New York Times gave front-page treatment to the data, derived from figures collected by the Center for Responsive Politics. The articles reflect nervousness in the corporate-controlled media over the degree to which the rising personal wealth of members of Congress is discrediting the institution. The proportion of members of Congress who have no net worth outside their home equity—the economic position of a majority of the working class—has declined from one in five in 1984 to only one in twelve. The Times contacted the offices of 534 members of Congress to ask if they had friends or relatives who had lost homes or jobs since the 2008 financial crash. Only 18 responded, and only 12 reported even a second-hand contact with the impact of the economic crisis. The median wealth of members of Congress rose 15 percent from 2004 to 2010, despite the financial collapse that devastated working people and for a time drove down the median wealth even of the financial aristocracy. In part, this was the result of congressional turnover—the incoming “Tea Party” Republicans were on average far better off than the Democrats or “establishment” Republicans they replaced, with a median net worth of $864,000 for the 106 members of the supposedly “populist” freshmen class of 2010. The Times noted that at least 10 members of Congress were worth over $100 million, including Congressman Darrell Issa, an auto alarm manufacturer who has the largest single fortune, as well as two leading Democrats, Senator John Kerry, the 2004 presidential candidate, and Congresswoman Nancy Pelosi, the current minority leader and former house speaker. The rising cost of congressional election campaigns will only strengthen the grip of the wealthy. The cost of a victorious US Senate campaign in 2010 was $10 million, while a successful House campaign had a price tag of $1.4 million. Winning candidates must either be independently wealthy, so they can self-finance, or sell themselves to enough corporate interests to generate the necessary campaign cash. This is even more true of presidential candidates, for whom a private fortune or the backing of major financial interests is indispensable. Barack Obama’s support in the ruling elite is demonstrated above all by the fact that he out-raised his Republican opponent John McCain by three to one in 2008. He is projected to become the first candidate to raise and spend $1 billion in 2012. The Post and the Times have good reason to worry over the discrediting of the US political system. The vast and historic socio-economic polarization in America is giving rise to a political polarization: not the mock conflicts between Democrats and Republicans that are the exclusive focus of the corporate-controlled media, but the real conflicts between the working population and an isolated and arrogant financial aristocracy. Working people are increasingly conscious that official Washington represents government of, by and for the rich. This political and social reality accounts for the dismal standing of Congress in the eyes of the public, with only 11 percent approving of the record of the current Congress according to one recent poll. The popular disaffection extends not only to elected officials, but to the two officially recognized parties. According to an analysis of voter registration statistics published December 23 by USA Today, more than 2.5 million voters have left the Democratic and Republican parties since the 2008 elections, with the Democrats losing 1.7 million registered voters and the Republicans losing 800,000. These figures are a significant undercount, since 22 states do not identify voters by party registration. In the 28 states that do, Democratic registration fell in 25 and Republican registration in 21. The number choosing to register as independents has risen by 400,000 during the same three-year period. The popular alienation from the traditional two-party structure will inevitably widen as a new generation of working people, with no prospects for a decent job and secure future, comes to maturity. A separate survey by Scarborough Research last month found that nearly 50 percent of young voters classified themselves as independent or unaffiliated. The first open expression of these sentiments came in the Occupy Wall Street protests of the past three months, although still limited mainly to layers of youth and students. Despite the desperate efforts of Obama’s apologists in the trade unions, liberal publications like the Nation and pseudo-left groups like the International Socialist Organization, these protests were characterized by hostility to both parties. As broader layers of the working class come into struggle over fundamental economic and social issues—jobs, living standards, the defense of public services like education and health care—the conditions will develop for the emergence of a mass political movement of working people, independent of and hostile to the existing parties of big business.